Bentley's Boutique Hotel, BW Premier Collection located in the heart of Osprey, Florida, is an unique alternative choice for Sarasota and Venice Hotels. 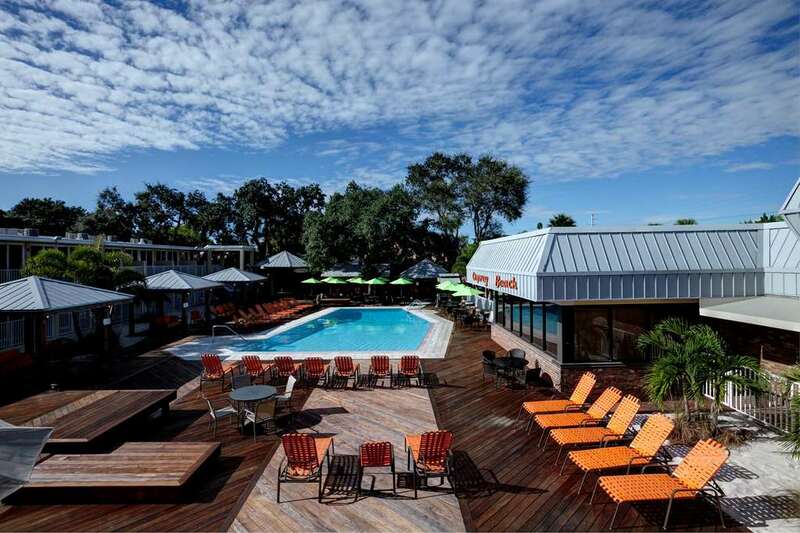 Bentley's Boutique Hotel provides a boutique atmosphere lodging in the Sarasota and Venice area near the beautiful Gulf Beaches, such as Siesta Key Beach and Casey Key Beach as well as award winning golf courses. With our recently renovated rooms, each room is equipped with a European influenced decor, you will be able to choose from either a beautiful Deluxe King or Deluxe Double Bed. Rooms either look upon our custom-built Infinity Pool or have a park view. Our beach property located on Casey Key, 4.6 miles south of our main property, is a unique "Cape Cod" influenced hotel nestled between Sarasota and Venice, Florida. Step out of your brand new cottage style room onto Casey Key Beach located directly on the Gulf of Mexico. Sarasota area attractions and dining are just minutes away. Beautiful sunsets await you from your front porch or from our beach which is just steps away! Camping - .4 mile(s) from Oscar Scherer State Park, camping, fishing, bird watching, hiking/nature trails, boating, bicycling, etc. Beach - 9.67 mile(s) from Siesta Key Beach, located on Siesta Key, rated number 1 beach by Dr. Beach and TripAdvisor . Siesta Key Beach boasts clear, shallow waters and 99% pure quartz sand. Pool - 4.3 mile(s) from YMCA-Selby Aquatic Center, consists of a 50 meter Olympic size pool, diving pool and water park. Outdoor pool - Outdoor pool, heated, available only at the mainland property at 1660 S. Tamiami Trail in Osprey At the Beach Property we do NOT have a pool just the beautiful Gulf at 221 Casey Key Road in Nokomis. From: Fort Pierce. Take FL-70 West, approximately 97.1 miles Turn left onto FL-72 West for 36.8 miles. Turn left to merge onto I-75 South in 5.4 miles. Take Exit 200 FL-681 towards Venice/Osprey in 5.3 miles. Merge right to Osprey onto US-41 N/Tamiami Trail for 2 miles. Turn left onto North Lane. Turn right into Bentley's Boutique Hotel, BW Premier Collection . From: Tampa. Travel south on I-75 for 64.7 miles. Take Exit 200 FL-681 towards Venice/Osprey for 5.3 miles. Merge right to Osprey onto US-41 N/Tamiami Trail for 2 miles. Turn left onto North Lane. Turn right into Bentley's Boutique Hotel, BW Premier Collection . From: Orlando. Travel west on I-4 approximately 90 miles. Travel south on I-75 for 64.7 miles. Take Exit 200 FL-681 towards Venice/Osprey for 5.3 miles. Merge right to Osprey onto US-41 N/Tamiami Trail for 2 miles. Turn left onto North Lane. Turn right into Bentley's Boutique Hotel, BW Premier Collection . From: South Beach, Miami. Take Florida's Turnpike and I-75 N. for 212 miles. Nokomis Beach,4.89 mile(s) from Nokomis Beach, the closest public beach to the mainland hotel with free parking just south of our mainland hotel.